What was it in that dish that made your mouth catch fire? Bring in the usual suspects for questioning and put together a lineup. The green bell pepper is a little bitter - but he's got an alibi. And the yellow bell pepper is too sweet to pull of something like that. 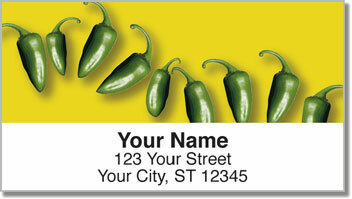 Which leaves us with the jalapeno or the cayenne chili pepper. So what do you think? 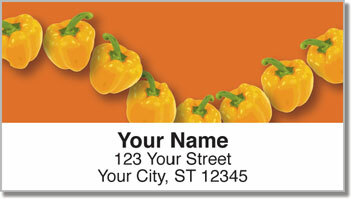 These unique return address labels are a great way for foodies, chefs and vegetable gardeners to freshen up their mail with something colorful! Isn't it time you added a little flavor to those boring letters and packages? But the best thing about this product is how it makes life a little easier. 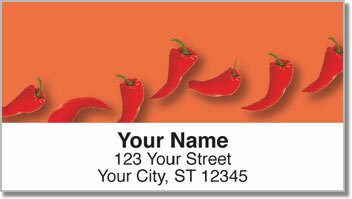 Thanks to a self-adhesive backing, all you have to do is peel and place. 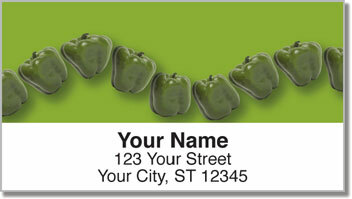 Order your very own Pepper String Address Labels today! Matching checks are also available.